Mio Navman is launching a new range of feature-rich sat navs under its new Spirit brand, targeting tourists, telly addicts and drivers looking to upgrade their current personal navigation device (that's PND, for short!). Yes, you read that correctly. Telly addicts. As Mio Navman is set to launch the Spirit TV - the first sat nav device to include a Freeview tuner. The 7-inch Mio Navman Spirit TV really stood out at the company's launch of its latest range in London this week – although no word on when we'll be able to get hold of one other than 'at some point later this year'. In addition to the digital telly tuner, the new devices will pack in Google search, a walking mode with loads of points of interest (POIs) for pedestrians, flaneurs and tourists alike. The sat nav tellies are coming out in two sizes - 4.7- and 7-inch – priced around £200 to £300 – with pricing still to be finalised, somewhere around the £200 to £300 bracket. For now though, if you are in the market for an impressive new sat nav you can get your hands on the nice and bright 4.7-inch widescreen Spirit 500, a pedestrian-friendly palm-sized 3.5-inch screen 300 or the iPhone-inspired Spirit Flat, all of which offer "ground-breaking sat nav functionality and fantastic content from Google and wCities to enable drivers to explore more on the road." Perhaps the most obvious thing to say about the form factor of Mio Navman's latest Spirit range is that they are really nice and slim, perfect for slipping into the pocket of your manbag. The Mio Navman Spirit 300 in particular would be ideal for those that do a lot of wandering around the city. And while 'Spirit' refers to the new software that powers the range, built around nice and simple coloured blocky icons that are pretty much idiot-proof, as one Mio rep described them at the launch, TechRadar cannot help but wince at the slight branding overkill in the product naming. After all, while we often hear ourselves saying "have you got the sat nav?" or "have you got the TomTom?" we cannot imagine saying to our other halves, "have you got the Mio Navman Spirit?" For the basic sat nav stuff, Mio's TruMap views are much cleaner and easier to read than before, with new junction views and improved next turn road names and directions, "enabling drivers to keep their eyes on the road…" plus, "spoken navigation is now louder and clearer with Navman Spirit's built-in FM transmitter, allowing users to tune the device into their car speakers via the radio." What is more exciting (and what you will want to show off to your mates) are the Explore Mode, Google Local and Wcities Travel Books features in the Mio Navman Spirit range. Explore Mode gives you a bunch of clear icons showing you what's nearby "from cash machines to hotels, museums and local attractions, car parks, restaurants and more" while you can also hook up to your mobile via Bluetooth to get all the detail you need via Google Local or even buy new Wcities travel guides if you are off on a city break. TechRadar is especially keen to try out the new pedestrian mode on our jaunts in and around London, as the new built-in 2D city maps and more should really make this a sat nav that you will no longer want to leave in your glove compartment (for thieves to relieve you of). Providing the battery life works okay, of course - which has always been the let-down factor with such devices to date. Mio's Navman Spirit range is available in UK stores now. 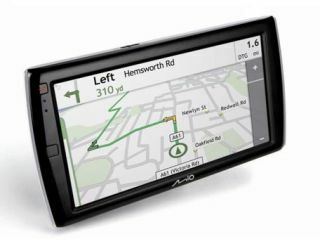 If you are in the market for upgrading to a trendy new sat nav check out mio.com for more.